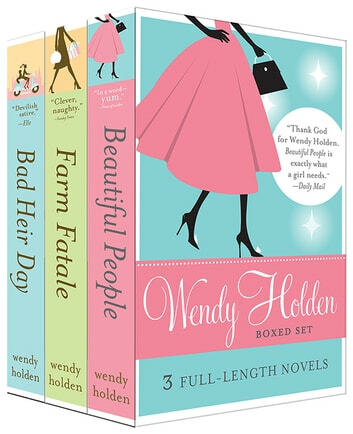 From the bestselling author of women's fiction, The Wendy Holden Boxed Set contains three of Holden's most witty and romantic romps: Beautiful People, Farm Fatale, and Bad Heir Day. Darcy is a struggling English rose actress when The Call comes from L.A. An Oscar-tastic director. A movie to make her famous. The hunkiest costar in Hollywood. So why doesn't she want to go? Belle is a size-zero film star but she's in big, fat trouble. Hotter than the earth's core a year ago, she's now Tinseltown toast after her last film bombed. Can she get back to the big time? Emma is a down-to-earth, down-on-her-luck nanny trying to weather London's cutthroat childcare scene and celebrity mom whirlwinds. What will it take for her to get back in control of her own life? Jet to London, Hollywood, and Italy; toss in a passionate star chef, a kindhearted paparazzo, and a reluctant male supermodel; and find Wendy Holden at her best-a smash international hit. Cash-strapped Rosie and her boyfriend Mark are city folk longing for a country cottage. Rampant nouveaux riches Samantha and Guy are also searching for rustic bliss-in the biggest mansion money can buy. The village of Eight Mile Bottom seems quiet enough, despite a nosy postman, a reclusive rock star, a glamorous Bond Girl, and a ghost with a knife in its back. But there are unexpected thrills in the hills, and Rosie is rapidly discovering that country life isn't so simple after all. Anna's boyfriend is impossibly handsome, impossibly rich, and generally just impossible. When he inevitably dumps her, she vows to give up men and throws herself into her career as an aspiring novelist. Which is how she ends up working for Cassandra. The social climber from hell, Cassandra has a huge mansion, a philandering rock star husband, Satan for a son, and a bestselling writing career that has massively stalled.